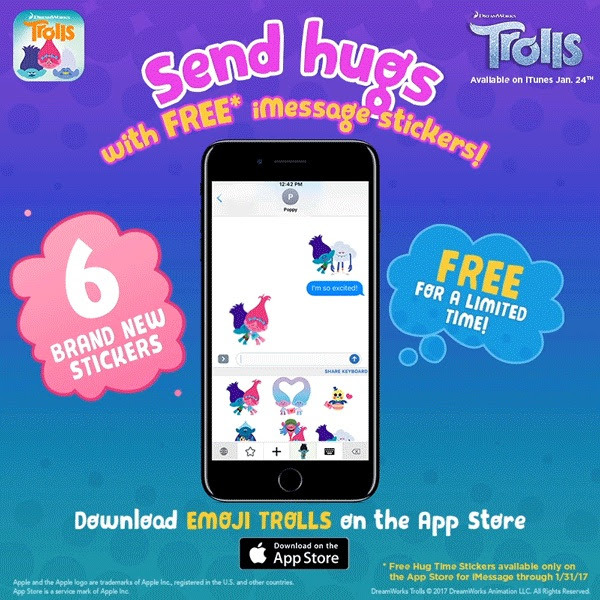 Just in time for National Hug Day on Saturday, January 21st, and the Digital HD release of Trolls on January 24th, a special DreamWorks Trolls Hug Time sticker pack (6) will be made available for free for a limited time starting today. Created by Bare Tree Media, Emoji Trolls is available to download on the iTunes App Store and Google Play, and includes free Trolls stickers, as well as an assortment of 2D and 3D animated stickers for sale. Users can express their happiness by sharing photo stamps and stickers based on their favorite Trolls characters. The Emoji Trolls app is now available across leading mobile messaging platforms. After January 31st, the Hug Time stickers will be available for $1.99.